Given the scale of the defeat, and the massive political implications for the left and for trade unionism as a whole, we make no apologies for a further post on Grangemouth. 1) Ratcliffe wanted to impose worse terms and conditions. Unite in Grangemouth opposed this. Members voted for rejection of the new terms and conditions. The issue here was: opposing new terms and conditions. 2) Then Ratcliffe says he is going to close Grangemouth. The issue therefore changed. Now the issue was: keeping Grangemouth open. To keep Grangemouth open, it was legitimate/necessary to accept the new terms and conditions. 3) The decision to accept the new terms and conditions can be judged only against the situation referred to in (2), not against the situation referred to in (1). A more sophisticated version of the above can be found in an unsigned article on the STUC website, which uses the theme of ‘the demise of the industrial correspondent’ as a way of explaining the chain of events which led to Unite’s decision to accept the new terms and conditions. The article has clearly been written by someone with ‘inside knowledge’. It’s equally clear from the article, assuming that it is accurate on this point (and I think that it is), that the convenors (and, by extension, the shop stewards committee) took the decision to accept the new terms and conditions (i.e. it was not a decision imposed on them by McCluskey, and certainly not by the Unite Scottish Regional Secretary Pat Rafferty, who is incapable of imposing anything on anyone). Meanwhile, Workers Liberty have published another very well informed piece that calls for a reassessment of the traditional, crude “bureaucracy vs rank and file” approach in the light of what happened at Grangemouth. The enormity of the defeat suffered by Unite at Ineos in Grangemouth is virtually impossible to exaggerate. For the workforce the new terms and conditions mean a major cut in their terms and conditions of employment. Jobs will be axed (for sub-contractors as well as for Ineos staff). And Ineos workers have been left defenceless against further attacks in the future. Ineos has got its way on everything. Basic pay will be frozen until the end of 2016. There will be no bonus payments until then either. The shift allowance is being cut from £10,000 to £7,500. Overtime rates and holiday entitlements are being cut as well. Contractual redundancy pay is being replaced by the statutory minimum, and the final salary pension scheme is being replaced by a defined contributions one. Workers will pay higher contributions in exchange for a worse pension. The scope of collective bargaining with the recognised union (Unite) is being cut back. Full-time convenors are to be replaced by part-time ones. And Unite has agreed not to engage in any industrial action for the next three years. According to some press reports, the new terms and conditions also include mandatory overtime which may be unpaid, a higher retirement age, and Ineos to have the right to alter terms and conditions as they see fit in the absence of consultation. But the knock-on effects of the defeat go well beyond the Ineos workforce itself. 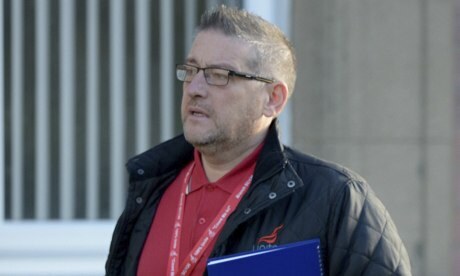 Unite, it should be remembered, balloted its members for strike action in defence of plant convenor Stevie Deans. It gave Ineos notice of a 48-hour strike (subsequently withdrawn). And it successfully campaigned for members to vote against the Ineos “survival plan”. With only a few exceptions, Unite is now the object of a sustained tirade of abuse in the mainstream media, in articles by political commentators, in the comment section of online media, on websites, and in a host of other forums. Unite is targeted not for having eventually agreed to the Ineos ultimatum but for having stood up for Stevie Deans, for not having accepted Ineos’ demands at the outset, and for having exposed and denounced Ratcliffe’s economic and social thuggery. “The unions need to engage with the situation properly, not fanny around making stupid political gestures. Unite called a strike over a pathetic and petty issue related to Labour Party internal politics. “By the time the union woke up to the reality workers faced, it was too late. Workers at Ineos need proper union representation – right now, they are getting the fumbling, dumbed-down, politicised opposite. Last weekend’s Sunday Times also reported that a thousand Unite internal e-mails had been handed to the police, allegedly revealing “a concerted union plot involving threats, intimidation and dirty tricks” to “thwart” the Labour Party inquiry into claims that the Falkirk parliamentary selection process had been rigged by Unite. Under the headline “Ineos to Sack Union Boss”, another article in the Sunday Times reported that it was “expected” that Ineos would sack Unite convenor Stevie Deans on the basis of allegations that he had spent time as union convenor on Labour Party work. In recent months Stevie has been: suspended and reinstated by the Labour Party; investigated by the police, who found no case to answer; suspended and re-instated by Ineos; subjected to three different investigations by the company; witch-hunted in the press; and scapegoated for Ineos’ decision to threaten closure of Grangemouth. Then, in the midst of disciplinary proceedings, his anti-union employer handed over to the anti-union police and the anti-union Sunday Times a dossier of Stevie’s e-mails, allowing anti-union Tory MPs from the other end of Britain to call for the Labour Party and the police to re-open their investigations into Stevie. The scale of the defeat inflicted upon Unite and the workforce at Grangemouth cannot be exaggerated. Ineos has had its way on everything: pay will be frozen until 2017, the shift allowance will be slashed (from £10,000 to £7,000), the final salary pension scheme will be replaced by a ‘defined contributions’ scheme, enhanced redundancy terms will go, Unite’s collective bargaining rights will be curtailed, and there will be a three-year no-strike deal. All that was in place before the latest news that convenor Stevie Deans has tonight resigned from his job with immediate effect. Inevitably, sections of the left are already screaming “sell-out” at Unite. Shiraz doesn’t have any inside information at this stage, but we are aware of credible reports that, following the closure announcement, Unite came under considerable pressure from its Grangemouth membership to accept the Company’s terms. The most detailed report so far published in the left press has come from The Socialist, which noticeably avoids any crude charge of “sell-out”, though it is critical of Unite. The article is marred by the ridiculous suggestion that Unite’s failure to call for nationalisation earlier than it did was a result of its policy of ‘reclaiming’ the Labour Party. The article also states that “the Unite Scottish secretary, Pat Rafferty, supported by the Unite general secretary Len McCluskey, was at that point [ie after the closure announcement] urging that the union sign up to the company’s demands” as though Rafferty and McCluskey were trying to force Ineos’ terms onto a reluctant membership – something that does not seem to have been the case. Ineos and billionaire owner Jim Ratcliffe have announced a reversal of the company’s plan to shut the petrochemical plant at Grangemouth. This follows a significant defeat for Unite on workers’ terms and conditions, demanded by the brutal Ineos management as part of their “survival plan”. While playing Russian roulette with the lives of thousands of workers, the billionaire Ratcliffe was sailing his £130 million luxury yacht around the Mediterranean. He recently applied to build a £5 million mansion in Hampshire. There were cheers at the mass meeting when the workers were told the plant would re-open. Having been told on Wednesday that 800 jobs were lost, it is understandable that the announcement was welcomed – at least for now. It will also bring relief to the around 2,000 sub-contracted workers at the site who were in the midst of being laid off. Ineos had said they were going to liquidate the company that ran the petrochemical plant. This would have meant workers lost thousands, and in some cases tens of thousands of pounds, in redundancy payments. Under current statutory redundancy terms post-liquidation workers would have been entitled to a maximum of £13,500. As part of the deal Ineos will be bailed out to the tune of £134 million in Scottish and UK government grants and loan guarantees. The company claims it needs this to ensure a £300 million investment at Grangemouth over the next few years. After claiming the business was on its knees, Ineos is now saying the site has a 15 to 20 year future ahead of it. This is further proof that the company was lying about the so-called “financial distress” of the plant. If this u-turn by the bosses was a result of being forced into a retreat by collective trade union action by Unite members, including an occupation of the plant, the reopening of Grangemouth would be seen as a step forward by trade unionists at the plant and beyond. However, this was not the case. Instead Unite has agreed to sign up to the company’s “survival plan”. This includes no wage rises until 2016, cuts in bonuses resulting in a loss of up to £15,000, the tearing up of the final salary pension scheme, a three-year no-strike deal, and an end to full-time union convenors on site. It was yesterday, so we’re a bit late. But it’s still well worth showing some solidarrty with these brave women in their campaign for a basic human right. Budapest, 22 October 2013: The ERRC is concerned by increasing reports of children being removed from Roma families, following reports about a child taken from her home in a Romani settlement in Greece. Another child has since been removed from her home in Ireland, according to media reports. We ask the media to act responsibly in reporting the situation, especially as the full facts of the original case have still not been established. The ERRC is aware of at least one report from Serbia where skinheads tried to take away a two-year old boy from his parents because he was “not as dark as his parents”. Irresponsible reporting could have severe, negative consequences for Roma families across Europe. If a crime has been committed in Greece, and this is still by no means clear, those who committed it should be treated as individuals, not as representatives of their ethnicity. Such a case could arise in any racial, ethnic, religious or national group. Criminality is not related to ethnicity. Roma children are, however, much more likely to be put into state care, trapped in segregated education, and forcibly evicted from their homes. These are the stories that don’t make it to the front page. We urge restraint, and we urge all local authorities, media outlets and other stakeholders to fully examine the facts before acting. The family said they were “delighted” that their daughter had come home. In a statement issued through their solicitor the family said: “Her removal has been a cause of huge upset to her parents, her brothers and sisters, and the young girl herself. “They now intend to concentrate on looking after their family and, in particular, in trying to reassure their daughter that she will be left in their care. “Our clients also wish to say they do not believe that what has happened to their family over the few days should ever have happened. “They do not accept that this was any proper or sufficient basis to take their daughter away from them. “Everyone was very sad,” she said. The sister added she hoped no other family would have to go through a similar ordeal. A Garda statement said: “Protecting vulnerable children is of paramount importance to An Garda Síochána and we continue to work in partnership with the HSE (Health Service Executive) and other agencies to ensure children’s safety.